With the Xiaomi Mi 7 close to its launch date of May 23 as confirmed by an official poster, the flagship phone is reportedly spotted online in Geekbench results. According to the latest Geekbench listing, the model appears with the name Xiaomi Mi 7 instead of appearing again with its codename ‘Dipper’ as it did in the month of March, which was widely speculated to be the Mi 7. The new model slightly differs from ‘Xiaomi Dipper’ spotted earlier. If this is supposedly the real Mi 7, then Dipper could be a variant of Mi 7. It could also be exclusive to a specific region or come with different specifications at a later date. With no concrete information available yet apart from the two Geekbench entries, it’s tough to predict the difference between the two. Based on a new poster found on Weibo, the Xiaomi Mi 7 is expected to be launched on May 23. The poster holds a large number 7 as its logo and the time of the year syncs with the manufacturer’s release schedule in the past confirming that this could be their next big flagship announcement. The Xiaomi Mi 6 was launched in the month of April and the new model in the series getting to stores in May does sound like a credible rumor to take note of. Based on the GeekBench listing, the upcoming model will be powered by MSM8998 (Qualcomm Snapdragon 835 SoC) combined with 6GB of RAM. The Mi 7 has some impressive specifications if leaks are to be believed. The phone is also expected to have an in-display fingerprint scanner which could be a groundbreaking move as even big brands like Samsung and Apple are yet to implement this new technology. The phone will also have Qi wireless charging and a 16-megapixel rear camera, according to rumors. Xiaomi Mi 7 may also have a top notch with an OLED display just like the iPhone X and the upcoming OnePlus 6. Most flagship models have embraced the top notch after Apple did it before they aim to become fully bezel-less in the coming years. 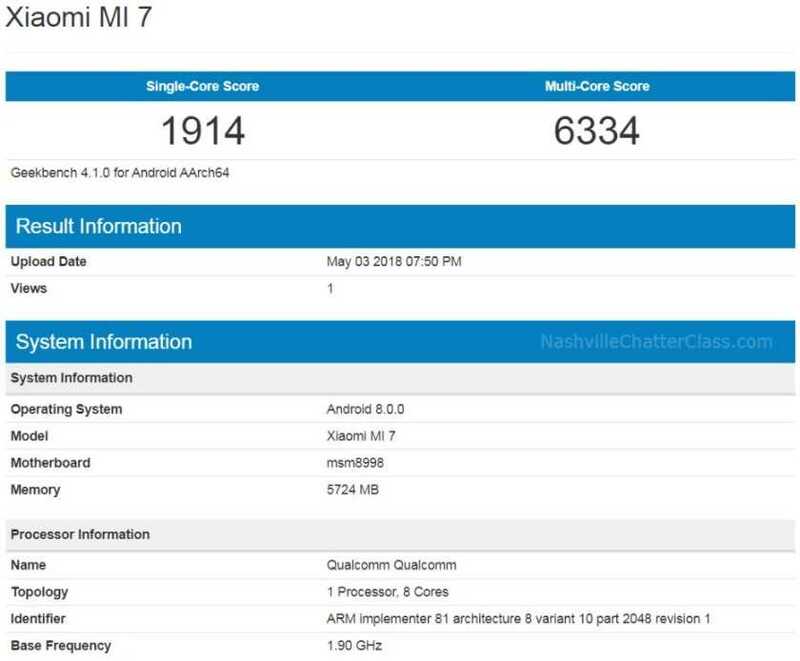 The latest entry in Geekbench with model name Xiaomi Mi 7 has 6GB of RAM and is powered by octacore Qualcomm Snapdragon 835 SoC and clocks at a speed of 1.90 GHz. On the other hand, Xiaomi Dipper had the same 6GB RAM with 8-core Snapdragon 845 SoC and clock speed of 1.77 GHz. Both models run on Android 8.0 Oreo OS. However, when it comes to single-core and multi-core scores, there’s a huge difference and that’s the surprising part! 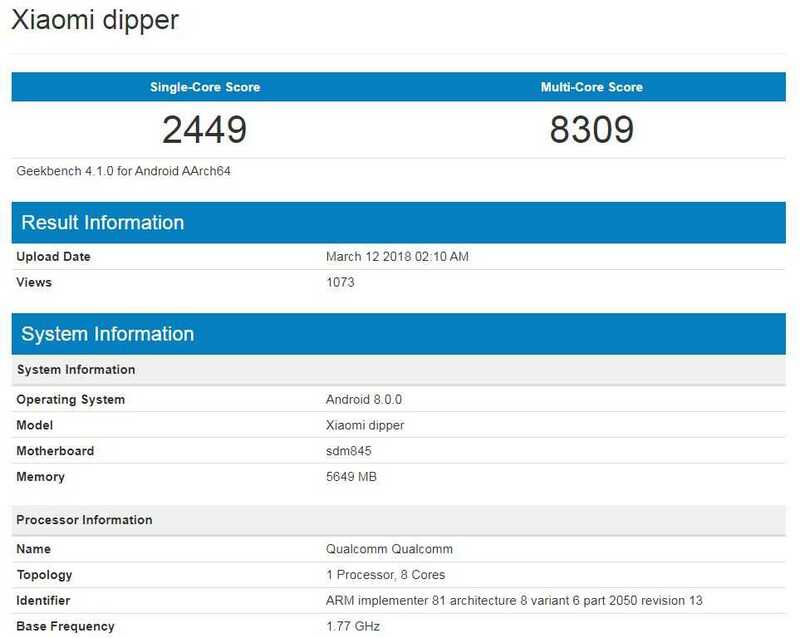 While the previous listing claimed Xiaomi dipper scored 2449 in single-core and 8309 in multi-core, the new Mi 7 variant scored just 1914 in single-core and 6334 in multi-core tests. Xiaomi could be planning to release a mid-range device and this could well be that one. It could also be a less expensive model or maybe this is the real hardware specs and scores of the Mi 7 which is set for launch soon.